As businesses begin looking strategically at big data as a way to improve their business performance, an important element of their efforts will be in the burgeoning capability of social analytics. 1. Social media has become the primary creative channel for new information. 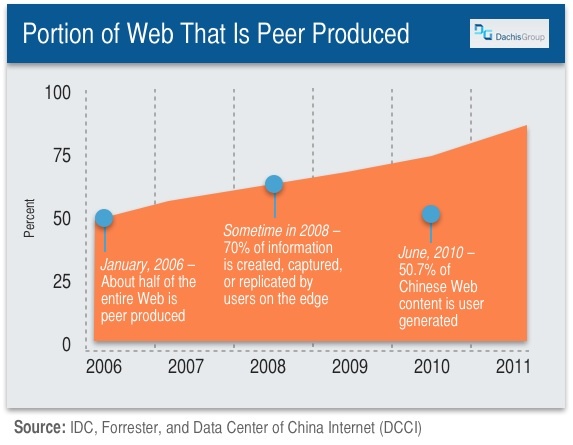 Most enterprises are just now realizing that the Internet, the world's largest network, is already mostly peer produced. As social media becomes more widely used inside the firewall, the same thing will happen. 2. Business intelligence must look at the whole ecosystem. Looking just at one's own databases, or even the information that business partners have, is no longer adequate. Having the big picture today means connecting internal business data to external information streams, live and without delay if possible. Data outside of your organization also outnumbers internal data by many orders of magnitude, so sifting through the integrated whole to spot trends and important issues quickly enough to drive business decisions is the objective. It's also the central challenge. 3. New techniques are required for social analytics as well as to handle the volumes of big data that result. Most traditional analytics tools aren't competent at processing social media very deeply, which typically includes connecting together distributed conversations across hundreds of social networking services, tying in any associated rich media, as well as deep integration with social media APIs. They also can't turn today's petabyte streams of raw information into usable strategic insight fast enough. Nor are they easy enough to use such that business intelligence tools can impact a large enough part of the business. See my recent exploration of specific big data techniques for more insight into this. The key to all this is combining together social analytics, which can deal with the unique aspects of social media with big data, which can process vast, real-time information flows quickly enough to matter. This results in what is increasingly called social business intelligence (SBI). It's the last item in particular that separates most analytics capabilities from actual business intelligence, while the rest is what big data helps brings to the table. The good news is that traditional business intelligence (BI) will remain essential for the foreseeable future, to look into and understand what's inside an enterprise's systems of record. Some will even move into social BI. However, the broader shift today to systems of engagement as a primary -- and even the majority -- source of new business information will almost certainly require fundamentally new social BI tools so that workers can quickly access ground truth and get the insight they need to perform their jobs. Disambiguation Note: There are at least two types of social BI gaining traction at the moment. The first is the use of a social layer within business intelligence tools to enable collaboration and the distribution of business intelligence using social media. The second type, which is what I'm referring to here, is the employment of business intelligence tools at social media activity itself, both global activity outside the organization as well as Enterprise 2.0-style activity inside. While the field is somewhat new, as social analytics has only had a real run-up the last two years, some obvious strategies have started to emerge. For now, most organizations will be trying to build basic social BI capabilities and get experience with them. They quickly discover that the level of effort needed and infrastructure required makes cloud-based offerings the route of less resistance -- at least in terms of cost, implementation speed, and competency -- to acquiring capability and starting to experiment. It's build, buy, or use the cloud. Whichever way, social BI = big data + social analytics + domain-specific BI apps. 1. Expertise and Reputation Tracking. Most organizations badly want to know if the information they see in their activity streams and social intranets is accurate and authoritative. Externally, they also want to be able to identify and keep tabs on influencers and experts. Social BI can be used to build and manage the large datasets needed to power apps that can provide these capabilities. A good example of this is Twiki's new embedded reputation widget, while a strategic real-life example is SAP's internal people finder application for which I published a case study on ZDNet late last week that uses BI tools aimed at both social media and IT systems to find the right expert using a custom-built mobile application. 2. Customer Engagement and Retention. While basic social analytics can provide a lot of raw data about what customers are doing in your social channels, understanding where key events are, what they mean, and how best to engage is where analytics turns into intelligence. Radian6 and IBM's Coremetrics are two of a great many examples of capabilities in this space that are billed as analytics but also have social BI features. 3. Social Business Adoption Tracking. This includes is everything from global k-factor analysis of external communities to packages for off-the-shelf adoption programs for internal social collaboration and CMS tools. 4. Funnel Analysis. Sales has long been a reports and stats managed function, but as demand generation increasingly focuses on social channels for building the inbound funnel, social BI can build a clear and integrated picture of what the funnel looks like in real-time without painstaking and time-consuming manual data collection and analysis. Kontagent is an example of a leading provider in this space. 5. Social Supply Chain Management. While I've been discussing the onset of social supply chains for a while now, pharmaceutical firm TEVA has been reporting actual benefits in implementing them. 6. Human Capital Management. Understanding employee performance, identifying external talent to recruit, and a host of other HCM scenarios are enabled with social BI. Example: Taleo's social networking integration features for talent sourcing. 7. Compliance and Regulatory Tracking. Companies in regulated industries need to understand their level of compliance with legal requirements through real-time analysis of social media activity within their organization and across the firewall. They also want to understand as soon as a compliance violation has taken place, something that often takes semantic analysis to determine. Socialware is almost certainly the leader in this space in helping companies deliver on this. 8. Brand Insight. While brand monitoring is easier in social media than just about any other medium, monitoring alone can require serious big data capabilities. But monitoring alone isn't enough and making sense of the mountains of information that brand analysis can create, especially in real-time, is where social BI comes. Examples of this include Visible Technologies' intelligence features as well as the Dachis Group's Social Business Index, to name two of a large number of entrants. Disclaimer: I am EVP of Strategy for Dachis Group. 9. Operations Management. When organizations roll out social tools internally and it results in open work processes, this can be connected to operational intelligence tools. Of all the strategic uses here, this is probably the most theoretical still, but will become more commonplace as companies realize they can use the open, observable work taking place within their walls to optimize, refine, manage, and transform the way they operate by literally being able to continuously maintain a sense of collective intelligence and situational awareness. There are other ways to apply social BI but these will be the most common ones for the majority of companies building or acquiring such capabilities. I'd love to hear stories about how you're applying social media analytics and/or big data techniques to your social business efforts in comments below or on Twitter. Are professional social networks ready to move into the enterprise? Six Social Business Trends To Watch Note: See point #4.